Fig. 7. (A) Langendorff heart preparation. (B) Working heart preparation. OJ Os release of creatine kinase (CK) and lactic acid dehydrogenase (LDH) (to assess cell necrosis) and malonaldehyde (MDA), a presumptive marker for oxidative stress. A 4-0 silk suture on a round-bodied needle is passed through the apex of the heart and attached to the apex, which in turn is attached to a force transducer. The heart rate (HR), force developed by the heart (DF), and first derivative of developed force (dFldt) are recorded.16 The hearts of all mice are generally subjected to 30 min of ischemia followed by 2 to 3 hr of reperfusion. Wild-type or transgenic mice are first anesthetized with sodium pentobarbital (80 mg/kg body weight, intraperitoneal injection; Abbott Laboratories, North Chicago, IL) and anticoagulated with sodium heparin (500 U/kg body weight, intraperitoneal injection; Elkins-Sinn, Cherry Hill, NJ). After ensuring an adequate depth of anesthesia, the thoracotomy is performed and the heart is excised and immediately immersed in ice-cold perfusion buffer. 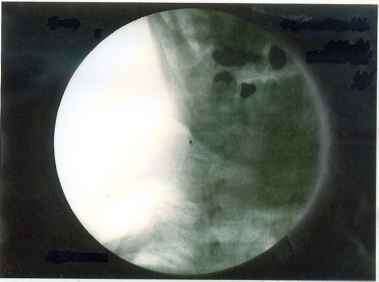 The aortic arch is quickly isolated and incised. The aorta is cannulated and retrograde perfusion in the Langendorff mode through the aortic cannula is initiated at a perfusion pressure of 60 mmHg. The perfusion buffer used in this study consists of a modified Krebs-Henseleit bicarbonate (KHB) buffer [composed of (in mM): 118 NaCl, 4.7 KC1, 1.2 MgS04,25 NaHC03,10 glucose, and 1.7 CaCl2, gassed with 95% 02:5% C02, filtered through a 5-yu.m filter to remove any particulate contaminants, pH 7.4] maintained at a constant temperature of 37° and gassed continuously for the entire duration of the experiment. 27 N. S. Gauthier, G. P. Matherne, R. R. Morrison, and J. P. Headrick, J. Mol. Cell. Cardiol. 30, 453 (1998). in that for our model we employ a fixed preload of 15 mmHg and a fixed afterload of 50 mmHg maintained by hydrostatic columns.25 Left ventricular, aortic, and left atrial pressures (LVP, AOP, and LAP, respectively) are monitored, analyzed, and recorded in real time with the Digimed data acquisition and analysis system (Micromed, Louisville, KY). Heart rate (HR), left ventricular developed pressure (DP), defined as the difference between the maximum and minimum left ventricular pressures, and maximum positive dlNP/dt are all derived or calculated from the continuously obtained left ventricular pressure signal. The preparation is allowed to attain steady state values of functional parameters. After a 15-min stabilization period, baseline functional data are recorded and perfusate samples are collected. 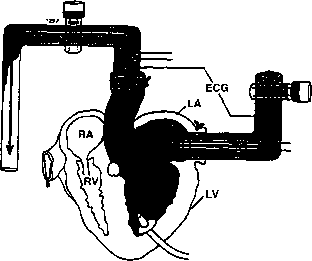 The hearts are then subjected to 30 min of global ischemia by arresting buffer flow through the left atrial cannula. Reperfusion for the first 10 min is commenced first in the retrograde Langendorff mode to allow for postischemic stabilization. Thereafter perfusion is switched to the antegrade working heart mode in the same way as described above to allow for monitoring of functional parameters which are recorded at various time points during reperfusion. Perfusate samples are also collected at these time points and, in addition, at 1, 3, 7, and 10 min of reperfusion in order to allow for the assessment of oxidative stress in the immediate early reperfusion period, during which it is typically the greatest. Necrosis and apoptosis have been found to contribute independently to the development of myocardial infarction. At the end of the 2- to 3-hr reperfusion period, hearts are removed from the apparatus and the atrial tissue is dissected away. The ventricles are either fixed in 10% buffered formalin or are immersed in 1% triphenyl tetrazolium chloride (TTC) solution in phosphate buffer (88 mM Na2HP04, 1.8 mM NaH2P04) at 37° for 10 min. 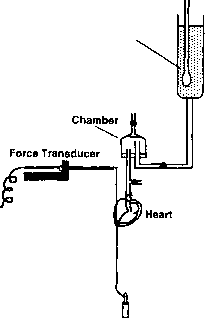 Hearts to be used for infarct size calculations (n = 3) are taken on termination of the experiment and immersed in 1% triphenyl tetrazolium solution in phosphate buffer for 10 min at 37° and then stored at —70° for later processing. Frozen hearts (including only ventricular tissue) are sliced transversely in a plane perpendicular to the apicobasal axis into approximately 0.5-mm-thick sections, blotted dry, placed between microscope slides, and scanned on a Hewlett-Packard (Palo Alto, CA) Scanjet 5p single-pass flat-bed scanner. Using NIH Image 1.6.1 image-processing software, each digitized image is subjected to equivalent degrees of background subtraction, brightness and contrast enhancement for improved clarity and distinctness. Risk as well as infarct zones of each slice is traced and the respective areas are calculated in terms of pixels. The weight of each slice is then recorded to facilitate the expression of total and infarct masses of each slice in grams in order to remove the introduction of any errors due to nonuniformity of heart slice thickness. The individual risk masses and infarct masses of each slice are summed to obtain the risk and infarct masses for the whole heart. Infarct size is expressed as a percentage of the area at risk for any one heart. To determine apoptotic cardiomyocytes, hearts kept in formalin are later embedded in paraffin according to standard procedures, and 3-//m-thick transverse ventricular sections are obtained to perform TUNEL [TdT (terminal deoxy-nucleotidyltransferase)-medicated dUTP nick and labeling] assays for the detection of apoptosis. Immunohistochemical detection of apoptotic cells is carried out using TUNEL in which residues of digoxigenin-labeled dUTP are catalytically incorporated into the DNA by terminal deoxynucleotidyltransferase, an enzyme that catalyzes a template-independent addition of nucleotide triphosphate to the 3'-OH ends of double- or single-stranded DNA. The incorporated nucleotide is incubated with a sheep polyclonal anti-digoxigenin antibody followed by a fluorescein isothiocyanate (FITC)-conjugated rabbit anti-sheep IgG as a secondary antibody as described by the manufacturer (Apop Tag Plus; Oncor, Gaithersburg, MD). The sections (n = 3) are washed in PBS three times, blocked with normal rabbit serum, and incubated with mouse monoclonal antibody recognizing cardiac myosin heavy chain (Biogenesis, Poole, UK) followed by staining with tetramethylrhodamine isothiocyanate (TRITC)-conjugated rabbit anti-mouse IgG (200:1 dilution; Dako Japan, Tokyo, Japan). The fluorescence staining is viewed with a confocal laser microscope (Olympus, Tokyo, Japan). Cellular injury in the myocardium exposed to ischemia-reperfusion is determined by estimating the amount of creatine kinase (CK) and lactic acid dehydrogenase (LDH) release from the coronary effluent. Estimation of CK and LDH is carried out with commercially obtained specific assay kits according to the manufacturer instructions. Malondialdehyde (MDA) is assayed as described previously28 to monitor the development of oxidative stress during ischemia-reperfusion. Coronary perfusates are collected at the time baseline functional parameters are recorded and thereafter at time points of 1,3,5,7,15,30,60,90,120,150, and 180minintoreperfusionfor the measurement of MDA. The MDA in the collected coronary perfusate samples is derivatized with 2,4-dinitrophenylhydrazine (DNPH). One milliliter of perfusate is added to 0.1 ml of DNPH reagent (310 mg of DNPH in 100 ml of 2 N HC1, 1.56 mmol of DNPH) in a 20-ml Teflon-lined screw-capped test tube, contents are vortexed, and 10 ml of pentane is added before intermittent rocking for 30 min. 28 G. A. Cordis, N. Maulik, and D. K. Das, J. Mot. Cell. Cardiol. 27, 1645 (1995). The aqueous phase is extracted three times with pentane, blown down with and reconstituted in 200 pi of acetonitrile. Aliquots of 25 pi in acetonitrile are injected onto a Beckman (Fullerton, CA) Ultrasphere Qg (3 mm) column in a Waters (Milford, MA) HPLC. The products are eluted isocratically with a mobile phase containing acetonitrile-H20-CH3COOH (34:66:0.1, v/v/v) and detected at three different wavelengths: 307, 325, and 356 nm. The peak for malondial-dehyde is identified by cochromatography with a DNPH derivative of the authentic standard, peak addition, comparison of the UV patterns of absorption at the three wavelengths, and by GC-MS. The amount of MDA is quantitated by performing peak area analysis with Maxima software program (Waters) and is expressed as picomoles per milliliter.